C1493. PIERRE BOULEZ Cond. 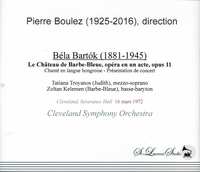 Cleveland S.O., w. Tatiana Troyanos & Zoltán Kelemen: BLUEBEARD'S CASTLE (Bartók), Live Performance, 16 March, 1972, Severence Hall. (Canada) St Laurent Studio YSL T-385. Transfers by Yves St Laurent. 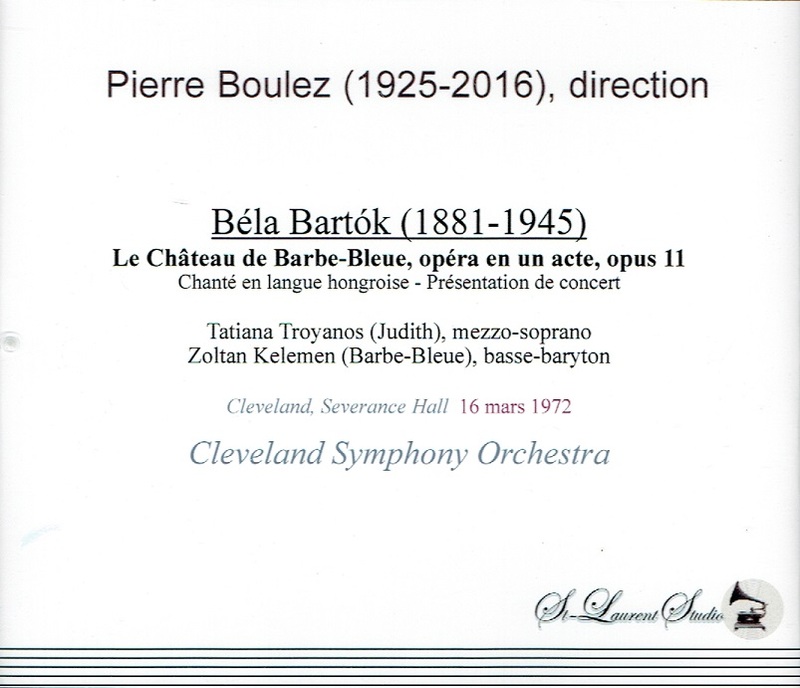 “The Cleveland Orchestra has a long history of performing and promoting contemporary music. From its beginning, the Orchestra has hosted composers from Sergei Rachmaninoff to Maurice Ravel and Igor Stravinsky, and commissioned and/or premiered works from Shostakovich’s opera LADY MACBETH OF MTSENSK to concert music for the theremin. One composer who has left an increasingly large mark on our legacy is Béla Bartók (1881-1945), the great Hungarian composer and ethnomusicologist. Bartók first wrote BLUEBEARD’S CASTLE in 1911, but reworked it over several years until it reached its final form in 1917. 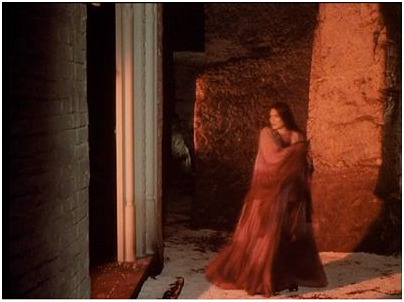 While as a whole the opera is recognizably in the dominant late-romantic style of the turn of the century (very much influenced by his older contemporary Richard Strauss), each door Judith opens unlocks a new musical landscape, from the harsh dissonances and menacing flurries of strings and xylophone depicting Bluebeard’s torture chamber behind the first door, to the immense and climactic chords for the full orchestra depicting the endless expanse of his domain behind the fifth door. [Yves St Laurent presents] an archival recording of a concert production conducted by Pierre Boulez with Tatiana Troyanos as Judith and Zoltán Kelemen as Bluebeard]." “Tatiana Troyanos, an American mezzo-soprano whose enormous repertory covered the full range of operatic history, from Monteverdi to Philip Glass, had a dark, flexible mezzo which was ideal for the wrenching emotionalism of such characters as Carmen, Kundry in Wagner's PARSIFAL, Eboli in Verdi's DON CARLO, Santuzza in Mascagni's CAVALLERIA RUSTICANA, and both Purcell's and Berlioz's Didos. And she was prized for the kind of vocal and dramatic agility, as well as the ability to learn difficult roles quickly, that made her a singer of choice for revivals of rarely performed Handel and Mozart works. She also performed in two RING cycles. Miss Troyanos found few opportunities in New York, but she was a fighter: When the Met offered her small roles, she turned them down….Miss Troyanos made her Met début as Octavian in 1976, and became one of the house's most frequently heard mezzos. Among the many roles she sang there were the Countess Geschwitz in Berg's LULU, Sesto in Mozart's CLEMENZA DI TITO, Charlotte in WERTHER, Adalgisa in NORMA, and her regular showpieces, Carmen, Kundry, Santuzza and the Composer [in ARIADNE]….Bernard Holland wrote in THE TIMES: ‘Ms. Troyanos's mezzo-soprano is intended less as a thing of beauty (which it often is) than as a conduit for the pain, exaltation and rushes of emotion that suffuse her musical personality’." "Tatiana Troyanos gives an impressive vocal portrait of Judith’s gradual evolution from timidity to strength. That high C at the opening of the fifth door, held for an extra couple of bars, really captures in a single note the distance she has travelled since the beginning."